I just returned from another trip to the Gulf Coast. Well, that's not exactly true. I got back on the 23rd of February but it takes a long time to get things caught up whenever I'm gone. I do want to thank the staff, Mary, Dr. Bradley and Dr. Louisa Fiacco (who served as relief veterinarian) for having things in good shape when I returned. However, it still seems like it takes longer to get caught up from being gone than the time that I'm gone. This is Sugar. She came in at noon the last day I was in New Orleans. Her owner had just been able to go to her home on October 17th. She had been left in her house with 3 bowls of food on August 28th. The house was had 3 feet of water inside so I assume that the bowls of food didn't make it past August 29. How she survived I don't know. Sugar was on last "week's" news. At that time she was still pretty sick. She is doing so much better. She has become pretty demanding of her attention from the office staff and will only eat HER specific brand of food. Believe me in October she would eat ANYTHING! I'm really pleased with her progress. During the time that Sugar was here she became "part of the family". She did end up showing some really scary and interesting problems that I believe were associated with the exposure to the New Orleans slime. There were times when I had real concerns that she would survive. It was much more than just the starvation. However, in the end she was pretty much a normal dog with normal dog issues. She lived in the office by day and at my home by night. She demanded the "best spot" on the bed at night. We have all known that it would be different when she went back home. 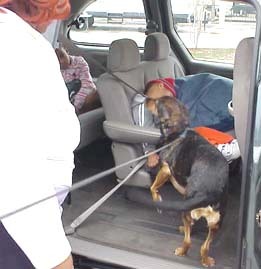 Sugars first contact with her owner on return to the parking lot of Winn Dixie in New Orleans was a surprise to me. She collected a pat from her owner but then leapt into the van to lick her owner's grandson all over his face. This went on for a minute or two and the child never even woke up! What kind of greeting was that!? After getting no response from her "nephew" Sugar must have figured she'd better turn her attention to her owner, Pam Horton, of New Orleans. Pam's home had been in the "Gentilly" area which was one of the hardest hit areas and one of the last places that residents were allowed back in. Her home was totally lost though, like so many other places, the walls were still intact. Pam lived on one of the cruise ships contracted with FEMA for residents. She works for the city government so at least her job wasn't washed away. For those who continue to follow the plight of people of New Orleans her optimism has been refreshing to me. She is really upbeat about the way that things are going. Things have seemed to fall into place. 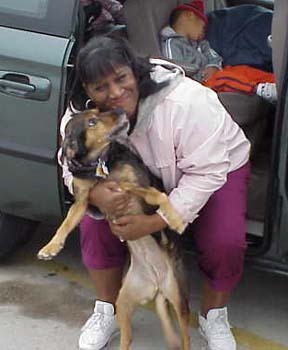 Pam, her daughter and her grand children found a place just across the Mississippi that she could rent that would accept a dog. In the cluster of four condos all of the other residents each have a dog. Many of the available housing areas apparently won't accept the rent voucher that FEMA has issued but these places would. The family is a little cramped but nothing like what it had been and it is a convenient drive for Pam to work. She goes on and on about the progress. And now she "has her Sugar back"! There really are still many pets that still need help in New Orleans and in the rest of the gulf area. There are still people working there to catch pets that have become feral in the streets. More urgent is the need to feed animals that are starving because, even if they could be caught, there are not enough homes that can take the deluge of animals without homes that have come from the area. As many of you know we still have 4 puppies that came from Ellisville, MS that were born just after Katrina without a home. People want to help but there are just so many in need. And, for those that area familiar with my first trip to the gulf coast this was the site of "The Winn Dixie" where so many street level rescuers took their animals to be sent of for fostering or placement. I chose this as the place to meet Mrs. Horton to get Sugar back home. When I got there Mrs. Horton had not arrived yet so I walked around the parking lot. You can't read the sign on the side of the RV parked in front of the building but it says "Animal Rescue". While I was waiting who should come along but Richard Crook. Richard Crook is a former firefighter from Michigan who took over the logistics of the Winn Dixie encampment, negotiated alliances with the National Guard and federal law enforcement that kept them in business. Richard was still there . . . since the first week of September. Pretty soon we'll have to say September 2005 to keep things straight! Don't get me wrong. There are a lot of different type of heroes of the effort. But these guys are the ones that I know. An interesting news blog about the folks involved in the rescue effort in general but especially about the Winn Dixie folks. I recognized at least 10 of the folks talked about in the story. After dropping off Sugar in New Orleans I drove to Tylertown, MS. Tylertown is the town one of our Mississippi refugee dogs, "Tyler", is named after. This is where Best Friends Animal Society has been maintaining a rescue camp trying to rehabilitate dogs for placement. As you can see it was wet while I was there. It didn't rain a drop during my fall trip and it didn't stop raining much during this trip. For the first several days it was in the forties most of the time though it did warm up toward the end of the trip. This is a view of the surgery tent which was well stocked with supplies . This is a view of the inside of the surgery tent. While things are a little crude there are most of the things that you need to actually practice medicine. Plenty of supplies and most of the equipment you really need. And electricity without the roar of generators! The big kettle in the back is the autoclave. A little old but it apparently worked fine. On the left side of the bright window is the anesthesia machine. Everyone was quick to try to explain to me how to make it work since it was so old. I was a little embarrassed to say that I have two machines just like it! I use one like it every day. At Best Friends one of the major uses of volunteers was one on one contact with individual animals. I'm sorry that I didn't get pictures of the volunteers with their dogs but much of what the volunteers there did was walk their individual dogs (each would only have 1 or 2 assigned to them) around and try to give them a variety of social situations. This is much of what this area was for so people could sit around with their individual charges and interact with others doing the same thing. Another view of the facility. The trailer was for storage. The entrance to the medical tent (separate from the surgical tent). This tent was home to WAY to many mice for my taste. We were (live) trapping them but I think they were reproducing faster than we could remove them. In the end the time spent at Tylertown was good but a little frustrating. I most hope that something good will happen that will make us more prepared for "the next time". "DCI is still functioning under Lisa Brabham's direction (the DVM in Ethel LA who was contracted to take things over after we left). We are down to 45 dogs there and about 10 cats. Unfortunately, HSUS is not going to continue supporting those dogs and is going to send them out to foster with "Bad Wrap" a group that does Pit bull rescue, since all the remaining dogs are pits. This would be fine except that other groups that took foster dogs did not give them a chance in my estimation , and many were euthanized as "unadoptible" just because their staff (the foster shelters...not the crew at DCI , who I thought did very well) couldn't handle the dogs. HSUS IS going to give a grant to DCI to set up a permanent shelter and train inmates as shelter help. we'll see how that works out. "Hollywood" and "T- bone" have been paroled in the meantime. Jon is still in DCI but reassigned from the shelter. Lisa saws the crew is doing a good job and the dogs and cats are being well cared for. This was all very frustrating and good at the same time. I still don't quite know what to think..."
I guess I don't know what to think either. T-bone and Hollywood were the two inmates that were described as crying in the runs during the dog transport out. I hope they do well. The second reason to mention this picture is that I opened Veterinary Economics (our business magazine) and there was an article about the DCI effort. All three pictures used for illustration were ones that I took and used on my story about the DCI experience on the site. His text indicated that this was a picture of the dogs arriving at DCI! Dr. Swift had contacted me asking if I had any digital pictures and I am thrilled that he used them. Wow, a published photographer! I couldn't resist putting this picture up for a little while. One of my tasks for my first weekend back was to pick up "land mines" from the dog play yard so Mary could have obedience training off leash without folks stepping in something in her class on Monday night. A pretty good haul don't you think. A second motivation for posting the picture is so the staff can relate to the motivation to go to using "poop bags" when walking dogs. You get used to it though I admit it's a hard habit to train yourself to do. "Remember O-2 and Whitey? Thought you might like to see them in their new home. They fit right in. Everyone, including Pepe and Sampson love them. Pepe (a neutered male standard poodle) actually "mothers" them, licking their ears and behinds. They are super entertainment. We're thinking of canceling cable! Thank you so much for your super care of these two before they became ours. They are now Zippity and DooDa."